Don't be fooled by the name! The 2n1 Rainbow Bounce House Rental is a unisex Bounce House and you can add a theme! 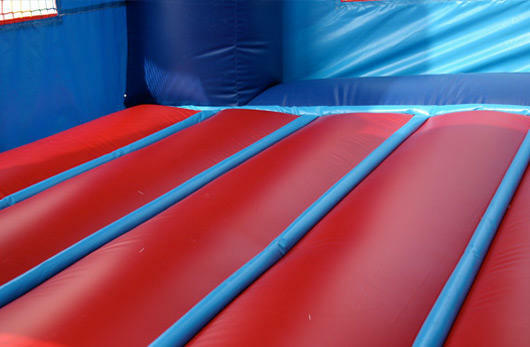 Your kids canenter this bounce house through our inflatable saftey ramp that protects their hands and knees from the ground. Once inside ther is a huge bounce area where they can jump and bounce for hours on end. In the right hand corner of the unit they will have the opportunity to shoot hoops on our Inflatable basket ball hoop. This bounce house rental is surrounded with colorful saftey netting that enables good ventilation and easy viewing for the supervising adult. This is a versatile bounce house perfect for themed parties, just add a banner, OR you can leave it plain and accomodate any party for boys or girls. 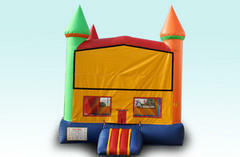 When you place this Bounce House in the cart you will have the opportunity to add a banner at no extra charge. Be sure to check out our Party Packages!